Kategorien: Altersmedizin, Geriontologie, Medizin, Wissenschaft | Tags: Alzheimer, Anti-Aging, Innere Medizin, Medizin, Stoffwechsel, Wissenschaft | Permanentlink. Neurons in the brain that produce the pleasure-signaling neurotransmitter dopamine also directly control the brain’s circadian center, or „body clock“ – the area that regulates eating cycles, metabolism and waking/resting cycles – a key link that possibly affects the body’s ability to adapt to jet lag and rotating shift work, a new University of Virginia study has demonstrated. The finding is reported in today’s online edition of the journal Current Biology. „This discovery, which identifies a direct dopamine neuron connection to the circadian center, is possibly the first step toward the development of unique drugs, targeting specific neurons, to combat the unpleasant symptoms of jet-lag and shiftwork, as well as several dangerous pathologies,“ said Ali Deniz Güler, a UVA professor of biology and neuroscience who oversaw the study in his lab. Modern society often places abnormal pressure on the human body—from shifting time schedules due to air travel, to work cycles that don’t conform to natural light, to odd eating times—and these external conditions create an imbalance in the body’s natural cycles, which are evolutionarily synchronized to day and night. These imbalances may contribute to depression, obesity, cardiovascular diseases and even cancer. Sleep disorders and abnormal circadian rhythms affecting the brain and other organs can worsen many pathologies involving aberrant dopamine neurotransmission, Güler said, including Parkinson’s disease, depression, attention deficit/hyperactivity disorder, bipolar disorder, schizophrenia and drug addiction. 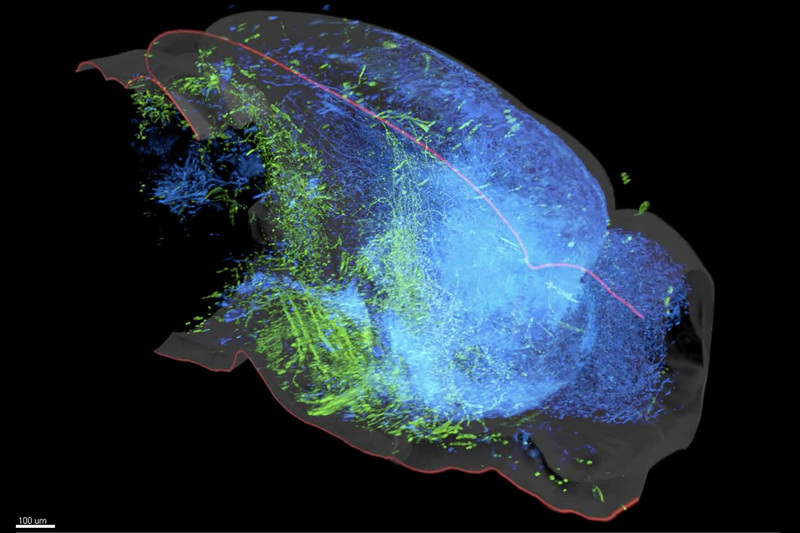 „New understanding of dopamine-producing neurons and the connection to the body’s biorhythms may go a long way toward treatments to alleviate the harmful effects of these serious pathologies,“ Güler said. Güler’s laboratory specializes in identifying neural circuits that govern biological rhythms in the brain, providing unique therapeutic targets for a range of diseases. Ph.D. candidate Ryan Grippo, Güler’s graduate student, led the Current Biology study. The researchers used two types of mice in their investigation: one normal, the other with dopamine signaling disrupted. By shifting the light schedules of the two groups by six hours, a jet-lag effect, they found that the dopamine-disrupted animals took much longer to resynchronize to the six-hour time shift, indicating feedback between the dopamine neurons and the circadian center. Kategorien: Allgemein, Geriatrie, Geriontologie, Medizin, Wissenschaft | Tags: Alzheimer, Anti-Aging, Geriontologie, Medizin, Regulationsmedizin, Stoffwechsel | Permanentlink. TORC1 ist ein Proteinkomplex, der mTOR und einige andere assoziierte Proteine mit einschließt. Dieser Komplex fungiert in der Zelle als Sensor für den Status von Nährstoffen, oxidativem Stress und Energie. Kontrolliert wird dieser Komplex durch Insulin, Wachstumshormone, oxidativem Stress und Aminosäuren, hier besonders durch Leucin. Ein aktiviertes TORC1 aktiviert seinerseits die Proteinbiosynthese. Um eine Zelle wachsen zu lassen, müssen eine Reihe von Ressourcen für die Proteinbiosynthese vorhanden sein, wie genug zelluläre Energie in Form von ATP, Sauerstoff, Nährstoffe, die richtigen Wachstumsfaktoren und so weiter. mTOR ist ebenfalls ein Protein, das eine Reihe von Aktivitäten der Zelle reguliert, wie das Zellwachstum, Zellteilung, Zellmotilität, das Überleben der Zelle, Proteinbiosynthese und Transkription bei der Biosynthese. Wenn also aufgrund der anspruchsvollen Anforderungen für die Aktivierung von TORC1 – ATP, Sauerstoff, Nährstoffe, die richtigen Wachstumsfaktoren und so weiter – ein Faktor fehlt, dann bleibt die Aktivierung von TORC1 aus. Und das genau geschieht beim Fehlen von Nährstoffen wie sie mit einer Kalorienrestriktion einhergehen. Kategorien: Allgemein, Geriatrie, Geriontologie, Medizin, Wissenschaft | Tags: Alzheimer, Anti-Aging, Freie Radikale, Geriontologie, Innere Medizin, Medizin, Mitochondriopathien, Regulationsmedizin, Stoffwechsel | Permanentlink.